Recurrent corneal erosions are a painful sloughing of the surface epithelial cells of the cornea that usually occurs first thing in the morning. They occur because the attachment of the surface epithelial cells to the cornea itself is weakened, often from a corneal abrasion or other trauma. Treatment often consists of contact lenses and eye drops, but sometimes requires Excimer laser superficial keratectomy to resolve this situation. Keratoconus is a corneal ectasia where the corneal tissue becomes weak, especially inferiorly, and bulges out slightly, like a weak spot in a tire. It is usually treatable with hard contact lenses; however, when it becomes too severe to treat with hard contact lenses, corneal transplantation is usually able to resolve the condition. There are many corneal degenerations and dystrophies, some inherited and some not. Both can be treated either medically or surgically, sometimes requiring a corneal transplant, but sometimes requiring simple, superficial scraping of the eye or contact lens wear. 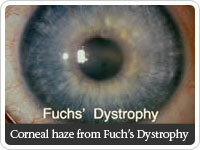 Fuch’s endothelial dystrophy is an inherited disorder of the corneal endothelium, the inner lining of the corneal tissue. In this disease, corneal endothelial cells slowly die off and usually in your 60s and 70s, the vision becomes hazy due to the cornea filling with fluid because these cells have died off. When it becomes hazy, the eye can usually be repaired with a corneal transplant. Corneal transplants are done when the cornea is so damaged that it cannot be used as a focusing tool anymore for the eye. When a corneal transplant is required, the central two-thirds of the cornea is removed with a circular blade, which works like a cookie cutter. A donor cornea is then used. The same circular blade is used to cut a button from the donor cornea and is placed where the central cornea has been removed and sutured into position. The operation takes approximately 30 minutes, is done under local anesthesia, and is not painful. However, clear visual acuity usually takes approximately six months after a corneal transplant. Herpes Keratitis is a recurring infectious ulceration of the cornea secondary to the herpes simplex virus. This is the same virus that causes cold sores around the mouth, but instead of causing a cold sore around the mouth, it causes a small ulceration on the corneal surface. The problem occurs when healing after the ulceration goes away, often scarring the cornea. If it recurs enough times, the scarring can severely affect the vision, often requiring corneal transplantation or other treatments. The earlier a herpes keratitis is realized and treated, the less chance for scarring. Band Keratopathy is a calcium deposition in the central cornea near the surface. It occurs often from chronic irritation or disease states in the eye. By using a chelation agent called EDTA, we are able to dissolve the calcium off the cornea and resolve the situation. Thygeson’s Keratitis is a corneal surface inflammation of unknown cause. It can occur in one or both eyes and just causes a foreign body sensation and light sensitivity. It is easily treated with mild steroid drops and usually resolves over a few months, but can recur. Infectious corneal ulcers are usually caused by bacteria ulcerating the corneal surface, causing a severe infection and corneal scarring. The most common cause is from contact lens overwear, and this usually occurs from sleeping in soft contact lenses overnight. This is treated with antibiotics and if the ulceration is not central, often results in recovery of the vision. However, if the ulceration is central and left untreated, it can often cause severe corneal scarring, requiring a corneal transplantation.